Tugg and Teeny: Jungle Surprises has been released! A few months back I introduced you to Tugg and Teeny (linked to my review), two characters created and presented in an early reader form and given to us by Sleeping Bear Press. Tugg and Teeny: Jungle Surprises is Book 2 in this four book series. The kids were excited to have this book arrive on our doorstep last week. They loved the first book. 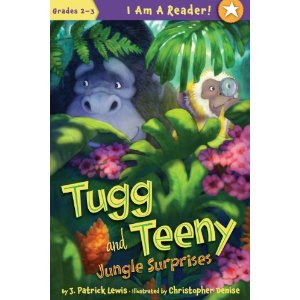 I'm not sure which they enjoy more - the stories and adventures that Tugg and Teeny get into together or looking at all the jungle animals which illustrator Christopher Denise brings to life. In this new book, Tugg and Teeny are "jungle detectives" on the hunt for various items that the different jungle animals have lost. They also discover what "wind fishing" is and have a good time with their fellow jungle pals. If you haven't yet explored the world of Tugg and Teeny, we highly recommend them. You'll be happy to know that once again I Am a Reader (Sleeping Bear Press) has generously offered a copy of BOTH Tugg and Teeny books to one reader here at Reading to Know. If you have not yet had the opportunity to look into this series, now is a good time! To win a copy of these first two books in the Tugg and Teeny series simply leave a comment below. This contest is open to U.S. Residents only and will be open through Tuesday, June 28th. THIS CONTEST IS NOW CLOSED. THE WINNER, as selected by Random.org, IS #13 - Stephanie @ Simple Things. Congrats! Thank you, I Am a Reader, for sending us a copy of this new book and for offering a copy of these books to one of my readers. Oh, I am so glad you reminded me about this series. They're on my list! I'd love to win! my youngest just started reading on her own and she loves animals :) off to check this series out more. We would LOVE to win these books! Thanks! They just look like so much fun! I love fun books! We love reading books together. We would like to win these books to add to our library. These would be great books for the children to read. Thanks. Looks like great little reading! I'd love to win these for my grandchildren! Thank you! Oh I didn't realize that a book 2 was out. Kyle really enjoyed the first one. I have a second grader who loves to read, especially to her little brother and sister. Would love to win these! Thanks!